Who Styles It Best: Tory Burch or Louis Vuitton? Following Spring's lilac trend, there are some striking S/S 2012 looks for fashion labels such as Tory Burch and Louis Vuitton. 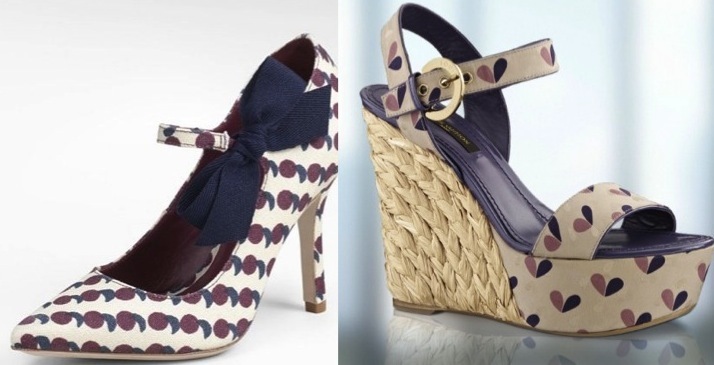 Both of these heels (the Tory Burch Printed Beverly High Heel Pump and the Louis Vuitton Tuileries Wedge Sandal in Violet/Rose) have purple and blue colors, accenting cute geometric shapes. Obviously, they differ as the LV is a wedge heel and the Tory Burch is a more traditional heel. Yet they are incredibly similar, aesthetically. Personally, I tend to lean more towards the Louis Vuitton sandals. Not just because they seem to be my current go-to label, but I'm absolutely in love with wedge heels and the sandal itself is so lovely. The Tuileries make me long for summer like nothing else. Not that the Printed Beverlys aren't great--the bow is simply amazing (i.e. I wish I could be speeding away on a Vespa wearing those beauties), but there's something special about the Louis Vuitton that just pulls my heartstrings. Which heel is your favorite?